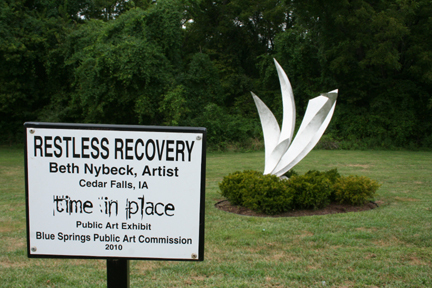 The above piece of art named "Restless Recovery" is one of four art projects currently on view at Pink Hill Park. The four piece display is titled "Time and Place". For more information on the Blue Springs Public Art Commission and public art in Blue Springs visit bluespringsgov.com and click on commissions. Fall is just around the corner and school has started. You would think that things would slow down in Parks & Recreation. Not so. We have lots of things planned to keep you and your family entertained during your leisure time. Check out what we have to offer you. We hope to see you in one of our programs, events or facilities. Ward Park to See Improvements! I have been holding off making the following announcements until I knew for sure they were actually going to happen. One is being funded by American Recovery and Reinvestment Act (ARRA) funds from the Federal Government, while the other is funded by the City. Both were originally scheduled to be started earlier this spring and finished by this date. However, in these economic times, you don't count on anything until it happens and both have been delayed several times. The first project funded by ARRA stimulus funds will be used to remove and rebuild the existing trail and transportation connections within Ward Park. We will be removing the existing 4' asphalt trail that was built in 1980 and replacing it with a new 8' foot wide asphalt surface. In addition, we will be adding a new section of trail on the west end that will connect to Quarry Road. When completed, the new trail will connect on the south side of Ward Park at 22nd Street, to the north side of the park at 22nd Street, and at Quarry Road on the west. We will install two new bridges on the west end. Some sections of the old trail will not be rebuilt as they are not necessary for the transportation aspect of the trail. Work on the bridges has already started while work on the trail is to begin within the next couple of weeks. We expect construction to take about two months with good weather. This project started in December of 2009 with the submittal for a grant from to the Mid -America Regional Planning Commission. Our second improvement involves the creek near the east end of Ward Park. Several years ago we stabilized a section of the creek in the middle of the park. Over the past several years, the creek has eroded up stream from the stabilized section, which if it continues to erode, will jeopardize various park facilities in the future. We plan to award the contract for this project in late September with work taking about two weeks. Work will require the removal of the eroded areas, placement of rip-rap rock, installation of gabion baskets (galvanized wire baskets filled with rock), and planting of native plant materials with matting to secure the embankments. Once completed, this should protect the embankment in the future. While we are under construction, Ward Park will remain open. We ask that you remain out of the construction zones. Please forgive our mess, but when completed, we hope you will enjoy the new improvements. 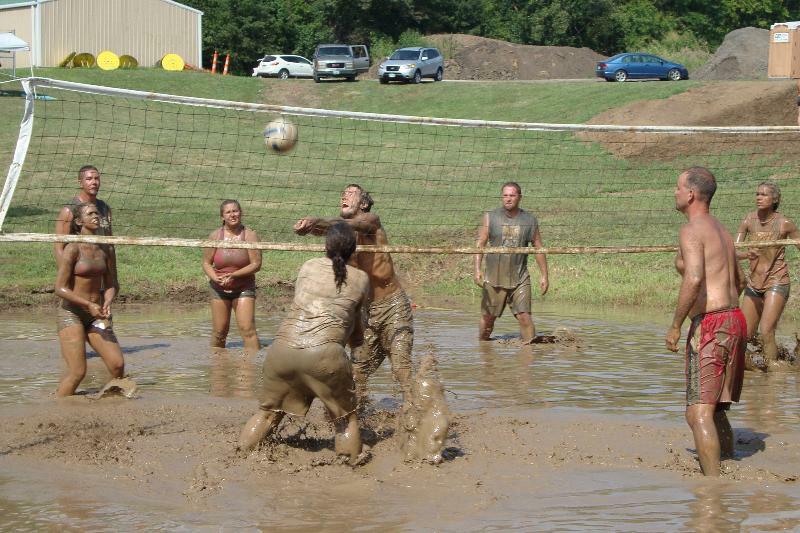 Without question, this is one of the favorite community events of the year! 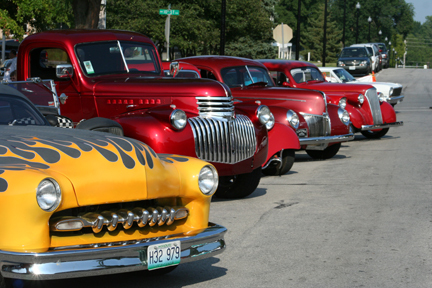 The Blaze-Off will take place on Friday, September 10, and Saturday, September 11 at Hidden Valley Park, 6500 NW Hidden Valley Road. Professionals and amateurs compete for cash prizes and awards. We're opening the Centennial Pool-Plex for the dogs! Saturday, September 18, from 12:00 - 3:00 pm, Centennial Pool-Plex, located at 2401 NW Ashton Drive, will be accepting the first 100 four legged swimmers for an opportunity to play and swim freely in the fenced outdoor pool area prior to draining the pool for the season. 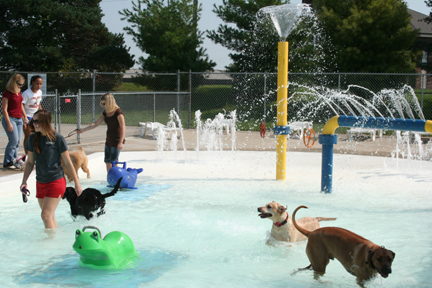 At $6.00 per dog, this annual dog swim is a benefit for the Blue Springs Off-leash dog park. Once again we will be selling Kansas City Renaissance Festival tickets at a discounted price. Adult tickets are sold for $14.00 each and children tickets being sold for $8.00 each. What: 2010 Kansas City Renaissance Festival gates are awaiting to open for the 34th season! 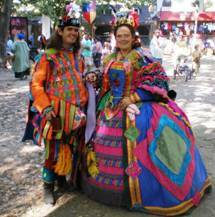 Nearly 16 acres of shaded lanes come to life with over 500 costumed characters, more than 165 artisans, 13 stages brimming with unique, live entertainment, festive and beautiful music and food befitting royalty! Go back 500 years to the time of the Renaissance and be amazed at what you see. When: Seven glorious weekends each autumn beginning Labor Day weekend, including Labor Day and Columbus Day, September 4th thru October 17th. The Front Gate ceremony begins at 9:45 am. Gates are open from 10:00 am until 7:00 pm, rain or shine. 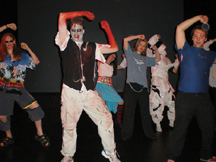 Learn the dance moves and 'zombie march' made famous in the Michael Jackson video. Performance October 31st at 6:15 pm before doors open for "Trick or Treat Street" and October 29th at 10:45 am, Vesper Hall. The instructional dance classes are open to all ages and held at Vesper Hall, 400 NW Vesper Street. The classes are held from 5:30 to 6:30 pm, October 7th, 17th, 21st, and 28th. The fee is $30.00 per person. This four class session is taught by Karen Hedges, long time instructor. Slick soled shoes are required for all classes. The fall issue of the Parks & Recreation of Blue Springs activity guide is now available. 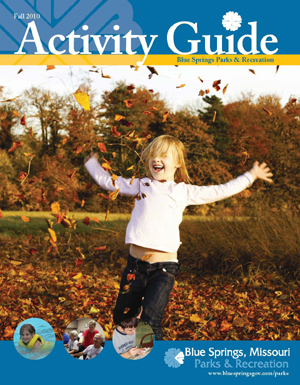 Click on the activity guide cover icon to view or download what we have to offer you. The 28 page activity guide is being mailed to every Blue Springs resident as part of the city's Blue Springs Magazine. The guide will inform you of our many fun and exciting activities, services and facilities that we have to offer. Please click on the Ativity Guide cover to check us out. 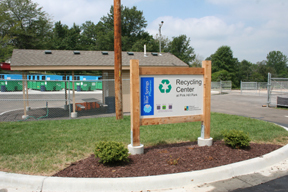 The City of Blue Springs is pleased to announce that our new recycling center is now open for public use. The recycling center is located in the northwest corner of Pink Hill Park, 1201 NW Park Road. Park Road is one mile north of Interstate 70, on the west side of Missouri Highway 7. The hours of operation are Wednesdays from 10:00 am to 6:00 pm and on Saturdays & Sundays from 8:00 am to 4:00 pm. The Recycling Center Hotline is 816-228-0228. The opening of the recycling center is the result of years of planning beginning in 2006 with the city's Solid Waste Management Commission making the center one of its primary goals. A majority of the funds to build the center came from a grant from the Mid-America Regional Council's Solid Waste Management District, which receives its funds from the Missouri Department of Natural Resources and the taxes collected from solid waste haulers dumping in the landfills. Access to the recycling center is free of charge to everyone, including Blue Springs residents and non-residents. The center is gated so be sure to come during open hours. Do not leave recyclable at the gate. There are cameras to watch for those who dump there trash. We now offer a convenient way for Blue Springs to GO GREEN. Riding a Bike - When you ask many adults when the last time they rode a bike is, they cannot answer. Although bicycling is a favorite pastime, many adults do not take advantage of this great option for exercise. Not only does bike riding exercise the body and build a stronger cardiovascular system, it allows you to get out and enjoy nature, fresh air, and new sites. Check out Blue Springs bike trail system and discover what great trails Blue Springs has to offer. Councilwoman Jeanie Lauer is inviting you to a free event! Congressman Sam Graves will be in the area to discuss small business legislation and provide an opportunity for you to ask questions. Lunch will not be served, but you may brown bag your lunch. Blue Springs Teams and Texas Roadhouse Needs Your Help! This flyer was posted late and is no longer valid. Sorry for the inconvenience! You can help our schools, Don’t miss this important article! Help our Schools win $500,000 from the Kohl’s Cares initiative. Follow the instructions below and be certain to submit your ideas for each school that you vote for. We are close to the top, but we need your support to be a winning school district! Which way will city go on trash? It seems some in our community, both residents and elected officials, are passionate about trash. It is interesting how certain issues generate such passion. The topic of discussion at the most recent City Council meeting is trash hauling in Blue Springs. Should it be managed by the city or left to the individual? Trash disposal issues have come up before. In 2008, the city reviewed a trash transfer station in an industrial area on the north side of town. Passionate citizen discussion followed, and ultimately the project went away. The city surveys the citizens, usually about once per year, to help the council set policy direction on a variety of issues. In the last survey the question was asked “How supportive would you be of having your city coordinate your residential trash and recycling services?” Seventy-three percent of respondents were supportive while only 10 percent were not supportive. When a survey shows that level of support, it is important for our council to further examine the issue and consider how best to respond. Appropriately, the city’s Solid Waste Management Commission began studying the issue and made a preliminary presentation to the council last week. 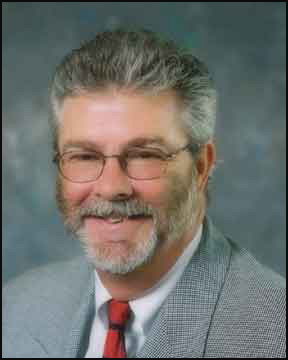 Councilman Fowler, who serves as council liaison on the commission, seemed out of sync with the report of the commission and, in a public e-mail to the rest of the council, seemed unsupportive of the commission’s work. In fact, Mayor Ross even reminded Fowler of his role on the commission. Fowler expressed concern that trash haulers would be put out of business if the commission’s initial recommendations were adopted. Some areas of our city have already consolidated control of trash hauling. For example, the Sherwood Village homeowners association made the decision several years ago to manage the contracting of trash pickup, periodically bidding the contract to local trash companies. No one knows the commission’s final recommendation, but it is important for everyone to keep an open mind, allowing the commission to complete its study, with public input. By law, our council members should not predetermine their response to this issue. It will be interesting to watch our mayor and council, both new members and those more experienced, as they examine the issue, seek residents’ input and reach a consensus. If you have an opinion on this or any issue affecting our community, please contact your City Council representatives. 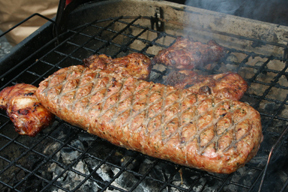 You can find their contact information at http://bit.ly/bscouncil. Come and visit with our guest. Learn history from local people about crocheting original designs, Hardanger needlework, wood working tools, vintage quilts, genealogy, crayon painting with fabric and felt art. Modern design quilts, old quilts, infant and children’s quilts and one of a kind original quilts on display. Local Artist will be painting in the garden. You will not want to miss the miniature quilt display with Kathy Fisher on Saturday. Sunday will be a must see 1/4 inch pieced quilt by Florence Evans mother Lola Perdue. It was pieced in 18 months by hand in 1935 and has 75,255 pieces. Recently, Wanda and I helped our youngest daughter, Ashley, move to Lexington, Mo., into a house she is renting, as she prepares to teach early childhood/special education there this fall. It surprises me how quickly time passes. It seems only yesterday that Wanda and I moved to Blue Springs. I remember our progression from apartment dwellers to home renters and finally homeowners. My parents were there to help with each move, and Wanda and I are pleased to be able to help our girls as they take their place in the adult world. For our community to be inviting, we need to provide for the entire cycle of housing choices that most people require as they make the transition from apartment rental to home ownership, and retirement or assisted living choices. As a community, we must ensure that quality housing is accessible at each step along the way. In Blue Springs, we have an appropriate mix of housing for our citizens to choose from, with rental opportunities, starter homes, move-up housing and retirement options. Last week the City Council expanded the options for qualified buyers by establishing a first-time home buyers program. District 1 City Councilman Dale Carter ran for office on a platform that included developing this type of program. Just four months later, he succeeded in receiving the unanimous approval of the council to establish a fund for first-time homebuyers using federal Community Development Block Grant funds. Wanda and I own a rental duplex townhome in Blue Springs, and over the years, we have rented to many young families who simply didn’t have the resources to make a purchase when they first became our tenants. We have found it typical that our tenants will stay for a few years, and then they are able to accomplish their goal of home ownership and purchase their first home. We are always thrilled to see this transition and ready to provide a home for the next family that is just one step away from home ownership. Dale’s program will make it easier for our city’s renters to take that next step and as a result provide buyers for those wishing to move to their second or third home. Without those first-time buyers, the cycle of home purchasing stagnates and the pool of buyers is reduced, which can cause home values to decline. So while the program provides a direct benefit for a limited number of homebuyers, the indirect benefit is much wider. Soon, with the development of Missouri Innovation Park, it will be possible for even more of our citizens to live, play, and work right here in Blue Springs! Congratulations to Councilman Carter for demonstrating effective leadership and for working with the mayor and the rest of the council to continue to keep Blue Springs the best place in the nation to raise a family!